WASHINGTON (CNN) - Former White House press secretary Tony Snow will join CNN as a conservative commentator beginning Monday. CNN president Jon Klein announced that Snow, a long-time political observer with a longstanding news background, will contribute to CNN as the network continues to broadcast winning political coverage. Snow most recently served as press secretary to President Bush. For 10 years, beginning in 1996, he appeared on Fox News Channel as the host of Fox News Sunday, Weekend Live with Tony Snow and other programs. Before joining Fox, Snow served as a substitute "From the Right" co-host for CNN's Crossfire. Snow has also been a newspaper writer, radio host and columnist, and a speechwriter in the administration of the first President Bush. WOW... CNN is now offcially DONE. No better than Fox News. Just one more sign that government is merging with media. I wonder if we'll be a full-fledged fascist country when I'm old. First they bring back Campbell Brown, big mistake, she is no better than Paula Zahn who left. Bernard Shaw: "... CNN continues to ape many of the on-air mannerisms of the Fox News Network, and I don't like that." 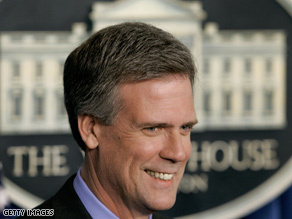 Former White House press secretary Tony Snow will join CNN as a conservative commentator beginning Monday. Thanks, CNN, for making me never watch your station again. What a joke. I am done with CNN! This man stood up and lied to the American people about important issues for months on end. That must look really good on a resume. Good luck to the Conservative News Network. Good.........Maybe this will be one person on CNN that's NOT in the TANK For Obama! CNN won't post this, they never do! Great news...not only that he's on board at CNN, but more importantly,that he's hale and healthy again. Looking forward to seeing you, Tony! I think it'll help get CNN more viewers, so it's a good move on their part. Been a fan of Tony Snow's for awhile, even though I kinda felt bad with how much reaching he had to do in order to explain the President's policies. He's a good guy, he'll be successful no matter where he goes. I suspect part of why he didn't go back to Fox News was to offset some of the image of Fox being in the tank for President Bush. Tony Snow is a very good man! I wish he ran for president. He will do a good job for CNN but, why choose CNN? They are far left press. Vote against Barack Obama in 08! You just lost a viewer...and I'm deleting this site from my favorite list. Anyone who will hire the devil deserves to be in hell. What time is he on? This way I'll make sure NOT to watch!!! I just love to watch the left nut up about such things!! I hope his health is good. Otherwise, see Chris from San Antonio. It will be refreshing to see some balance reporting from CNN. Question: Is CNN going to keep Glen Beck now that that have the Snowman? I mean how many more Conservative broadcasters is CNN willing to hire? Whose next? Ann Koulter? Whey does every news team need Left & Right wing propaganda machines? Call me crazy, but isn't the point to get OBJECTIVE reporting? No matter who you vote for, I think Obama is right about ending the game played with U.S politics. It's amazing we have to wade through the BS to get the non-spun story. I know Mr. Snow has been sick and I am happy that he is recoverying. I don't want to "bruise" his spirit but he has been a puppet for the Bush Administration and looked foolish trying to white-wash Bush's highly questionable activities. I have been getting the impression that your organization is getting more and more biased and I am disappointed. You use to be my favorite news station but you have changed. Hopefully things are changing. Don't be left behind. I wonder how long that he will be there. You can tell by his appearance that his cancer is starting to take affect. Welcome to Mr. Snow; wishing him a great recovery as well. At least here, he's not gonna have to tirelessly defend failed policies of an idiotic president nor will he have to defend elitist positions of a news network in quest opf credibility (Faux News).